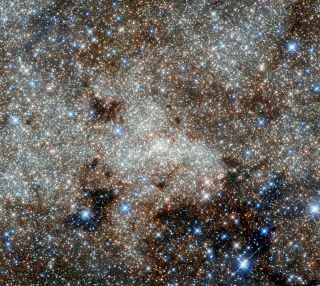 This imageshows the star-studded center of the Milky Way towards the constellation of Sagittarius. Image released Oct. 7, 2013. R.D. Boozer is an astrophysics researcher, host of the Astro Maven blog and author of the book "The Plundering of NASA: an Exposé" (lulu.com, 2013). He contributed this article to SPACE.com's Expert Voices: Op-Ed & Insights. The United States can be the number one spacefaring nation of the 21st century. NASA and American human space exploration can experience a renaissance, sending astronauts to Mars and the rest of the inner solar system: asteroids, comets and perhaps even the polar regions of Mercury. This can be accomplished without raising NASA's budget, by eliminating the excessively long wait for an economically impractical super-rocket. Currently, unnecessary spending on rocket systems hampers those goals. According to the original rocket proposal that President Barack Obama's administration sent to Congress, NASA was to develop a new, more efficient engine over a 5-year period for a gigantic rocket called a heavy lift launch vehicle (HLLV). This launcher would not be derived from space shuttle technology. Once ready, the HLLV would allow Americans to go to an asteroid or Mars. Concurrently, NASA was to introduce the capability for transporting astronauts to and from the International Space Station (ISS) via modern, commercial-market vehicles, along with new technology to produce "filling stations" in orbit (called propellant depots). The first of these two new techniques would drastically lower the cost of getting people from Earth to orbit, in what is now known as the Commercial Crew program. The depots would bring down the cost of deep-space travel and were to be constructed via ambitious manned spaceflights with commercial vehicles. A detailed outline of the plan was presented to Congress on March 24, 2010. That plan greatly bothered certain U.S. senators and representatives. The reason: The plan specified no space-shuttle–derived vehicles that would have kept federal tax dollars flowing to the Congress members' constituents. But these politicians knew that the most significant administration goal was for the Commercial Crew program to act as a stimulus for a thriving, private, commercial space industry. So they proposed a compromise: The Commercial Crew program would be allowed as long as work could begin on an HLLV derived from space shuttle technology, a project that would be named the Space Launch System (SLS). The shuttle-derived SLS is so expensive to develop that, for years, legislators chopped the budget for Commercial Crew below what the administration requested by hundreds of millions of dollars, funneling the difference to SLS. They thereby increased the amount of time during which the United States must pay the Russians to haul American astronauts to the ISS. Congress also took funds from the propellant depot infrastructure, which would have greatly lowered deep-space operational costs. In fact, SLS is so expensive that it leaves no funding to develop the new, large spacecraft and payloads the rocket is supposed to lift. NASA commissioned consulting firm Booz-Allen-Hamilton to do a study of SLS development. The group's report states that the project should meet its goals for the first three to five years, after which time the funding provided by Congress will be insufficient. In other words, completion of the project will be constantly stretched into the future because development goals will fall further and further behind schedule. Christopher Kraft and Tom Moser (two key engineers involved in the design and development of the hardware and systems that got American astronauts to the moon) have voiced their dismay about the situation. In an op-ed for the "Houston Chronicle," they point out that the bulk of the human space missions touted for SLS could be completed within the current NASA budget using a combination of existing commercial rockets and depots. The Space Development Steering Committee, an informal association of space industry notables, just released a study detailing the greater practicality of other methods for doing deep-space missions and the disadvantages of SLS. The committee consists of Apollo astronauts Buzz Aldrin and Edgar Mitchell, along withkey officers of the space advocacy organizations: the National Space Society, the Space Frontier Foundation and the Mars Society. Even if a large super-rocket like SLS were truly necessary, there are other, less-costly options. Before Congress forced SLS on NASA, private companies United Launch Alliance and SpaceX both gave quotes to NASA for HLLVs. Those quotes totaled together come to many billions of dollars less than the most optimistic cost estimates for SLS alone. The United States can start the great adventure of spreading Americans throughout the inner solar system sooner than most people realize. It's time for the country to decide whether or not being a space power is important enough to prevent NASA from being used as a dead-end, make-work, jobs program for short-term, regional interests.